Friday night, our guests could hear a nice music in the garden coming from an unusual place close to our Spa. When approaching, they could see an amazing arrangement: the Gazebo entirely decorated for a romantic dinner, closeby, a celebration area also superbly decorated and, between the two, a traditional Rindik orchestra so typical of Bali, composed of 3 players from the surrounding villages. All this spectacular set-up was arranged by our staff to celebrate the 25th Wedding Anniversary of our guests Mircea & Carmen from Romania. They decided to celebrate it in a little bit unique and different atmosphere in Dajuma. Starting with a blessing wedding ceremony on the beach, then took place the main blessing ceremony, ending up with a romantic dinner accompanied by the traditional Rindik music. 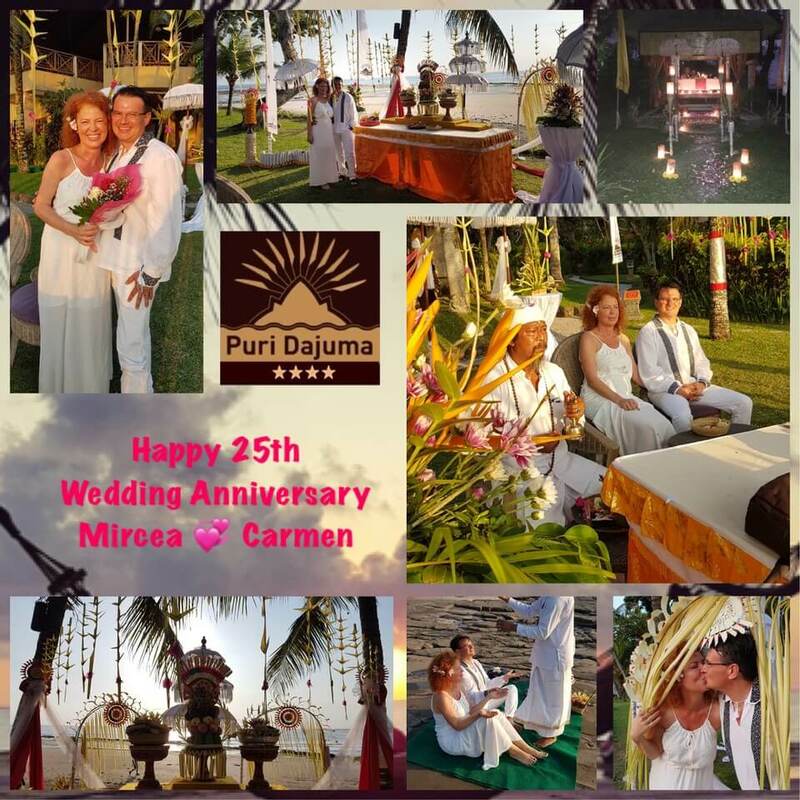 Congratulations dear Carmen and Mircea! Puri Dajuma hotel has been an oasis of serenity and love for us , the staff is professional with a kind attention to detail . Our anniversary was made perfect by everyone in the staff from Rondy to each and every one , the food , decorations , the room was perfect . We truly recommend this resort from the bottom of our hearts , much love to you all !